The European Synchrotron Radiation Facility is the world’s most intense X-ray source and a centre of excellence for fundamental and innovation-driven research in condensed and living matter science. 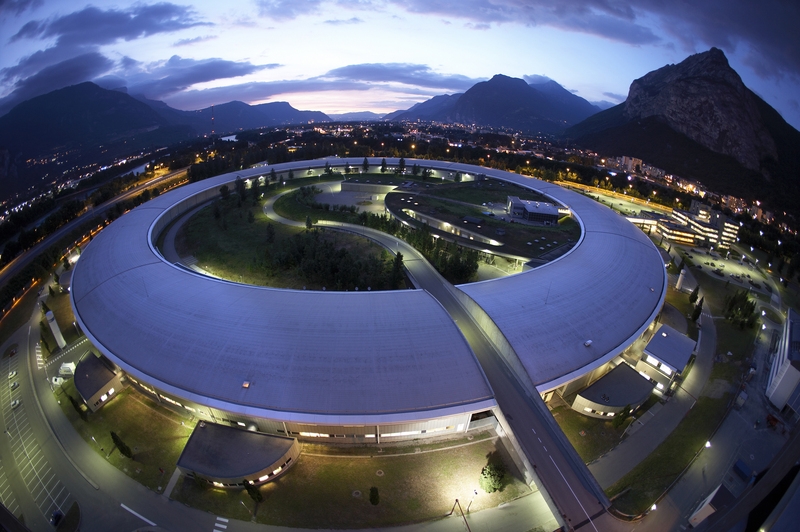 Located in Grenoble, France, the ESRF owes its success to the international cooperation of 22 partner nations, of which 13 are Members and 9 are Associates*. The ESRF produces X-rays 100 billion times brighter than the X-rays used in hospitals. These X-rays, endowed with exceptional properties, are produced by the high energy electrons that race around the storage ring, a circular tunnel measuring 844 metres in circumference. Each year, the demand to use these X-ray beams increases and thousands of scientists from around the world come to Grenoble, to conduct experiments at the 44 ‘beamlines’, each equipped with state-of-the-art instrumentation, and managed by highly qualified scientific and technical experts. Thanks to the brilliance and quality of its X-rays, the ESRF functions like a ‘super-microscope’ which ‘films’ the position and motion of atoms in condensed and living matter, and reveals the structure of matter in all its beauty and complexity. It provides unrivalled opportunities for scientists in the exploration of materials and living matter in many fields: chemistry, material physics, archaeology and cultural heritage, structural biology and medical applications, environmental sciences, information science and nanotechnologies. Following on from more than 20 years of success and excellence, the ESRF has embarked upon an innovative project, the EBS – Extremely Brilliant Source – project, highlighted as an ESFRI landmark. The EBS project represents an investment of 150 million Euros over the period 2015-2022. The principal aim of this project is to construct, inside the existing infrastructure, the first of a new generation of synchrotron, fully conceived and designed by ESRF accelerator scientists and engineers. With performances multiplied by 100 in terms of brilliance and coherence, EBS will lead the way in pushing back the boundaries of scientific exploration of matter, and contribute to answering the great technological, economic, societal and environmental challenges confronting our society. The EBS project includes also a new state-of-the-art beamline portfolio, an ambitious scientific instrumentation programme, and a ‘data as a service’ strategy to exploit the high performances of this new X-ray source. * France, Germany, Italy, United Kingdom, Russia, Spain, Switzerland, Belgium, The Netherlands, Denmark, Finland, Norway, Sweden are member countries. Israel, Austria, Poland, Portugal, Czech Republic, Hungary, Slovakia, India, South Africa are scientific associates.